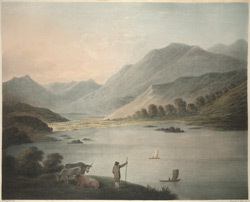 View by William Burgess of Crummock Water and Buttermere in Cumbria, Northern England. The two lakes are joined by a narrow strip of meadow land and it is thought that they were once joined. Buttermere is half the size of Crummock water but it has the more dramatic landscape being surrounded on three sides by the peaks of fells and hills such as Fleetwick Pike, Melbreak and Haystacks. William Burgess (1749-1812) was a topographical artist who was well known for his use of greys and blues as can be seen in this aquatint.